Lucy said: "Fabulous cafe set in an old Evangelical Lyceaum building with arched ceilings and creaky wooden floors, there are rumours that Ludovit Stur lived here. Created by Canadian Ben Pascoe, the cafe and bar has a magnificent collection of second-hand books, one computer where you can check your email and a gorgeous sunny courtyard in which to sip a beer and read the newspapers. They serve two Fair Trade and 2—4 exotic coffees. The staff are super friendly and helpful and there are often live jazz performances. The name has an interesting origin and comes from Pascoe’s attempt to memorise the Slovak language as it’s his version of ‘Nech sa paci’ (meaning ‘there you go’) which what waiters say when they bring your dinner or hold open a door. He also has a good way of remembering the Slovak for ‘cheers’ (Na zdravie) which is ‘nice driveway’!" 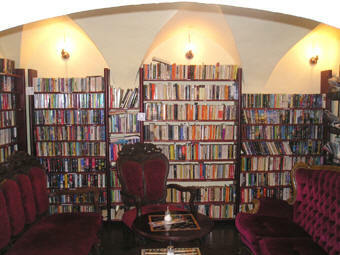 This is the only place in Bratislava where you can find a wide selection of used books in English. You can read the books while enjoying your drinks or you can take them home with you (if you return the book within a week you'll even get part of your money back). Most of the books range from 150Sk to 300Sk (cca. 5 - 10€). Besides fiction, crime novels, classics, sci-fi section, travel guides and all sorts of other books, the store has an interesting collection of books on politics and humanities in general. Be sure to check out the second part of the store as well - walk out into the courtyard, turn left and walk up the stairs - the humanities, more fiction and lots of unsorted books are kept there. The bookstore offers a great selection of imported second hand books of all genres. If you are looking for bestsellers, classics, fiction or fantasy, Shakespeare or Star Trek, they have them all. Their collection currently counts more than 2500 titles and continues to grow rapidly. In addition, you can also come to read one of our many newspapers and magazines. They currently subscribe to Economist, Wall Street Journal Europe, Guardian Weekly & Le Monde Diplomatique.